Hawaii could become the first US state to ban cigarette sales. Democratic state Rep Richard Creagan introduced a bill that would incrementally increase the minimum age to buy cigarettes, leading to a practical ban. Currently, the Aloha State doesn’t allow cigarettes to be sold to anyone under the age of 21. But under Creagan’s bill, the minimum smoking age would increase to 30 in 2020, 40 in 2021, 50 in 2022, 60 in 2023 and 100 in 2024. Creagan, who is also a physician, told the Hawaii Tribune-Herald that taxes and other regulations have only slowed down tobacco use. ‘It’s slowing it down, but it’s not stopping the problem,’ he said. 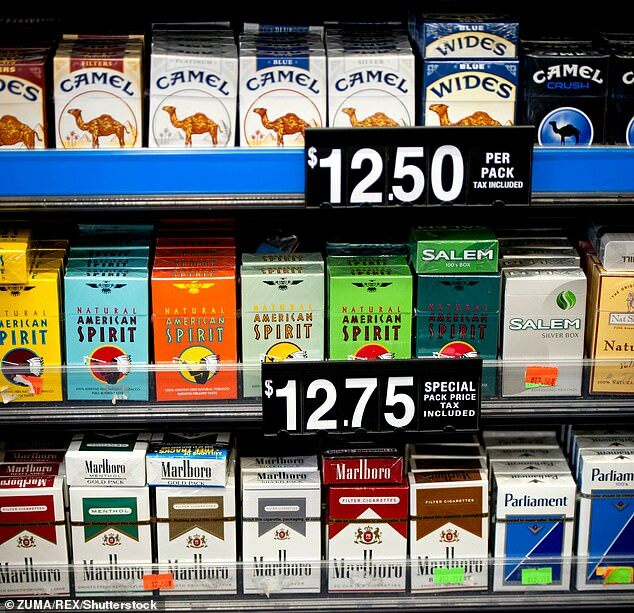 The bill would also make retailers pay a $500 fine if they sell cigarettes to anyone underage. Hawaii has some of the strictest smoking laws in the country and was the first state to raise the minimum smoking age to 21 in 2016. About 13 percent of adults in Hawaii smoke compared to the national rate of 17 percent, according to the Centers for Disease Control and Prevention. Hawaii also has the fifth-highest cigarette tax rate in the US at $3.20 per 20-pack of cigarettes. Opponents say the measure will create a nanny state in Hawaii and could lead to an increase in cigarette smuggling – but Creagan disagrees. ‘The state is obliged to protect the public’s health,’ Creagan told the Tribune-Herald. The state’s House Health Committee will hold a hearing on the measure this week, the newspaper reported. The new age limit proposed by the bill would not apply to e-cigarettes, cigars or chewing tobacco. However, the US Food and Drug Administration earlier this month threatened to pull e-cigarettes from US markets completely unless youth smoking rates fell. The agency found that vaping increased 78 percent among high school students and 48 percent among middle school students from 2017 to 2018.